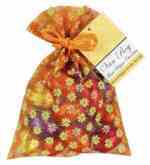 Personalised Easter bag filled with mini eggs are a net bag filled with Belgian mini eggs. Contents: Belgian chocolate eggs - Bag design may vary from picture. Colours: label attached to top of bag up to 4 colour process. Delivery time: 2-3 weeks as standard, please advise if needed sooner and we'll do our very best. Each of our Personalised Easter bag filled with mini eggs come with your business details and company logo printed on to keep your business advertised in this competitive market. Give them away to your customers this Easter as a promotional gift, they will be delighted and encouraged to give you repeat business. Stay advertised. Other promotional and personalised items besides our Personalised Easter bag filled with mini eggs Click here. To find out more about our Personalised Easter bag filled with mini eggs click here and fill in the contact form and we'll get straight back to you.